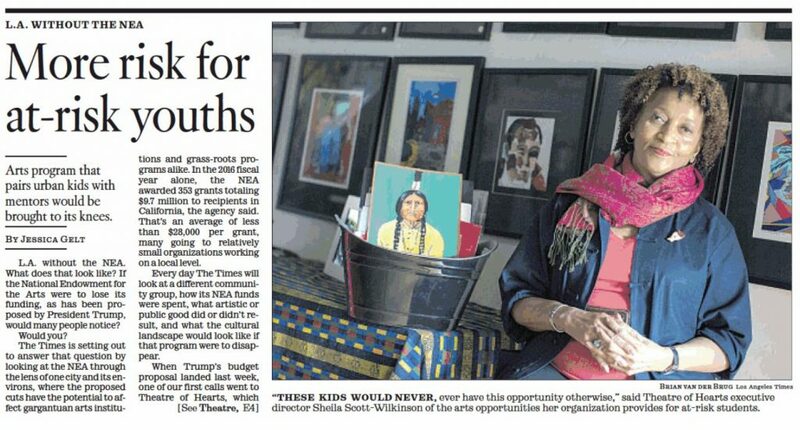 In response to the national budget proposed by the Trump administration, the Los Angeles Times interviewed Theatre of Hearts/Youth First Executive Director Sheila Scott-Wilkinson to discuss the future of the National Endowment for the Arts and arts education in the United States. Theatre of Hearts/Youth First stands with the National Endowment for the Arts. We have always sought to empower local communities through Artist-In-Residence programs and multidisciplinary workshops. To eliminate the NEA would be to eliminate a part of the fabric of our community and humanity. Our journey thus far would not have been possible without the support of: California Arts Council, Los Angeles County Arts Commission, Asian American Drug Abuse Program, Los Angeles Unified School District, Soledad Enrichment Action, The Annenberg Foundation, Los Angeles County Probation Department, The James Irvine Foundation, The Eisner Foundation, Preparing Achievers for Tomorrow, and initiative of the California Community Foundation, and The Flourish Foundation. Theatre Of Hearts’ collage workshop encourages self-expression through creation. The workshop helps maximize creativity and encourages meaningful engagement with group members. Using techniques taught by professional artists, teams work together to create collage artworks with a variety of art materials. Include our collage workshop as part of your work retreat or training sessions. Give your team down time, away from their computers and smart phones to allow creativity to flow and new ideas to form. Workshops are tailored to engage employees through group exercises. 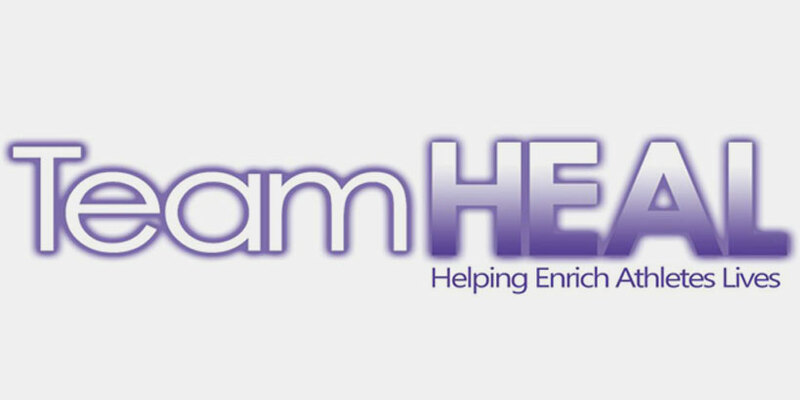 Theatre Of Hearts is a 501(c) non-profit. The cost of the workshop is a tax-deductible donation that will help fund Theatre Of Hearts’ Youth First Artist-In-Residence Program, a quality arts education curriculum for low income, under served youth in LA county. A win win situation for the parties involved. If you’re interested in having Theatre Of Hearts organize a collage workshop for your team, please contact info@theatreofhearts.org or call 213.384.6878 for more information. 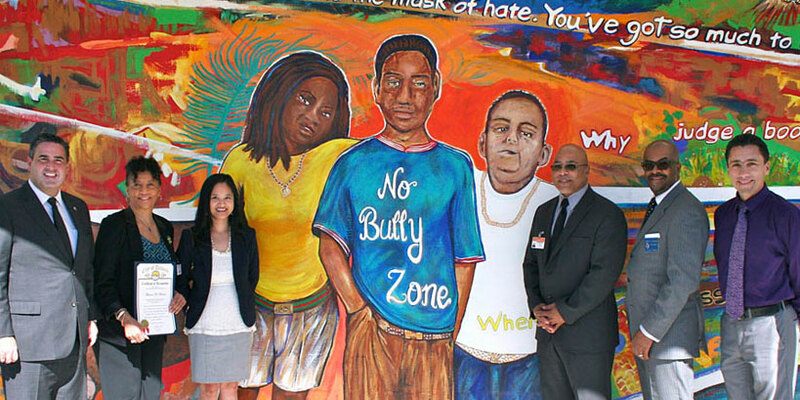 At Los Padrinos Juvenile Hall in Downey, 105 students produced two student-driven, large-scale murals as a part of TOHYF’s Literacy and Mural Project. Our Twitter feed is currently unavailable but you can visit our official twitter page @theatreofhearts.